Interview with Elizabeth Cooperman and Thomas Walton on their book The Last Mosaic, published by Sagging Shorts, a division of Sagging Meniscus. Recorded Sunday, October 7, 2018, at the home of Elizabeth Cooperman. Look at the promotional video for the new book The Last Mosaic and it doesn’t even mention that it’s a book. Try to figure out who of the two authors wrote what and good luck with that too. Still, this pocket-sized book of 121 or so pages is oddly compelling, funny, chock full of European history and the work of Elizabeth Cooperman & Thomas Walton, two Seattle poets active in the literary community for many years. Elizabeth by way of the University of Washington’s English Department and Pageboy Magazine and Thomas by way of that magazine, mostly and other activities. Welcome Writers of the Rome Mosaic! 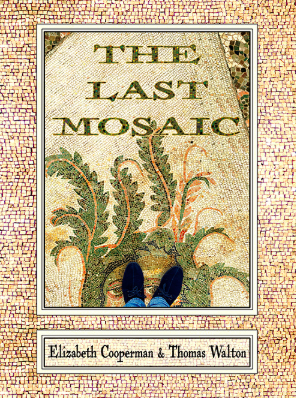 The Last Mosaic (Official Book Trailer) from Tyler Beaman on Vimeo. In the second segment, Elizabeth discussed the UW Rome Center and the writing class that happens there in the summer, where faculty member Rick Kenney urges participants to “keep your pencil on the city.” Daily prompts, daily sessions of sharing work written and immersion in the ancient culture of Rome are key facets of the class. Click here to listen to Part 2: 3:16. In segment three the idea for the book was discussed, accidentally going through each other’s Rome project notes and the near-death experience they had after leaving Rome for Sicily. They also each discussed the wisdom behind a shared or blurred authorship and the liberation they felt doing that and the conscious decision to employ negative capability as defined by Romantic poet John Keats. They also quoted Charles Olson on the notion of authorial ego. Click here to listen to Part 3: 6:29. In segment four they responded to the blurb from the back of the book which states “to be human is to be broken.” They talked about mosaics in Rome and how they became a less-valued art form, because paintings are portable and how the form of the book is to be broken and/or incomplete. They talked about the similarity of writing to dreaming and to John Berryman’s The Dream Songs regarding the notion of authorship. Click here to listen to Part 4: 7:00. In part five they read from the book and discussed the etymology of the word mosaic which is related to the word monster. They elaborated on a quote from the book that says: “the written word has not been so neglected since, perhaps, the Dark Ages.” Click here to listen to Part 5: 6:54. In part six they discussed the notion of how alphanumeric literacy may have re-wired modern brains to value masculinity over femininity and the use of the image by religions as a matter of control. They argued that when art became didactic, culture declined and read a passage from the book stating that. They also talked about taking a cobblestone home. Click here to listen to Part 6: 6:02. In part seven, they discussed the quote in the book that says: “It is a mistake to think that our minds somehow control our bodies and our emotions. The body runs the show. The mind is merely engaged in damage control.” Mind creates a narrative after a body reacts to whatever happens in our lives. They also discussed a quote on pages 39 and 85: “Beauty is that which we want to repeat” and the notion of having resonances in the book which are evocative in one way of the bells one is always hearing in Rome, sound ripples.They discussed the value of poetry in our culture. Click here to listen to Part 7: 6:49. In the 8th segment they talked about the process, about a argument they had at the beginning of writing the book and continued throughout the writing process, though they also say they had fun writing the whole book. They also discussed the experience of being in the ancient city of Rome and how it became clear to them that Rome is the foundation of all Western culture and that given Roman history, the current U.S. administration is survivable. Click here to listen to Part 8: 7:47. In the last segment, number nine, they read a passage on the Roman Emperor Tiberius and discussed how the ancient and present are happening in the same space and the same time. We think that we understand time, but they say being in a city like Rome, is that past, present and future exist in the same street. Also, as a writing, you can choose your ancestors. They talked about their writing ancestors and included Sappho, Sylvia Plath, Montaigne and Baudelaire and how writing is listening. Click here to listen to Part 9: 8:18.